The man’s right. On so many levels that probably never crossed his mind when he said those words. One. Women I know love risotto. While there’s evidently something very attractive about the idea of rice that’s so immensely creamy and sensuous that it becomes one with your tongue, I would argue that it’s the al dente heart of that rice, a proof of perfect sensibility and restraint, that makes risotto that much sexier than rice pudding. You can quote that. Two. Women are defensive of their toys, I mean, kitchen. Because, just like how children are forever fearing that their out-for-the-evening parents are late to return because they’ve died in a car crash, we girls grow up to fear that boys will burn down our kitchens once 30 minutes pass. Sorry, it’s not you, it’s me. But that doesn’t matter – risotto only takes 25 minutes, phew. Three. Women love men who can cook. It doesn’t have to be a romantic relationship. It’s just that everyone loves to have someone close who will, on the right occasions, cook for them. It could be a best friend, a brother, perhaps from a different mother, who cares? Who cares if they bought the dessert? They cared enough to make you risotto. I cared enough to make risotto. In all honesty, that’s all you need to make a good risotto. It’s not some pretentious art as gastromedia casts it. The only thing, which isn’t even difficult, is the constant stirring. Stirring increases the amount of the rice’s surface area which comes into contact with liquid, which in turn helps release the starch. This means you will have a very creamy risotto as the “creamy” texture is essentially the married portion of stock and starch. And at all costs, keep tasting – that’s key to catching your perfect al dente! the laying of my hands. As much as I love risotto, I think I would still appreciate it more if it goes along with several varying textural components, not to mention a even coverage of all the flavour bases. Here, aside from the creaminess and al dente of the rice, there is equally the buttery firmness of the halibut, the crunchiness of its skin, as well as the near-transparent crispness of the fried basil and ginger. The acidity of the lime is hardly detectable in the finished dish, but it is crucial to the balance of flavours – it’s what keeps you coming for another bite without feeling weighed down. 1 1/2 c short grain rice, do not rinse this! To make the risotto, melt the coconut oil in a deep saucepan or small pot. Add the onions and sweat them until soft, being careful not to brown them. Tip in the rice and stir until the grains are evenly coated with oil and are translucent. Stir in the curry paste until fragrant. Pour in 1 cup of stock and bring to a simmer, stirring constantly. Continue to add stock, 1 cup at a time, still stirring and keeping the heat low for about 15~18 minutes. Meanwhile, puree the fatty portion of the coconut milk with the basil and lime juice to a vibrant green milk shake. Chill until needed. Stir the remaining watery portion of the coconut milk into the rice. Once all the stock has been absorbed, taste your risotto and see if you like the doneness. It should be very creamy, but still retaining a bit of nutty texture in the center of each grain. Incorporate the coconut basil mixture and take away from the heat. 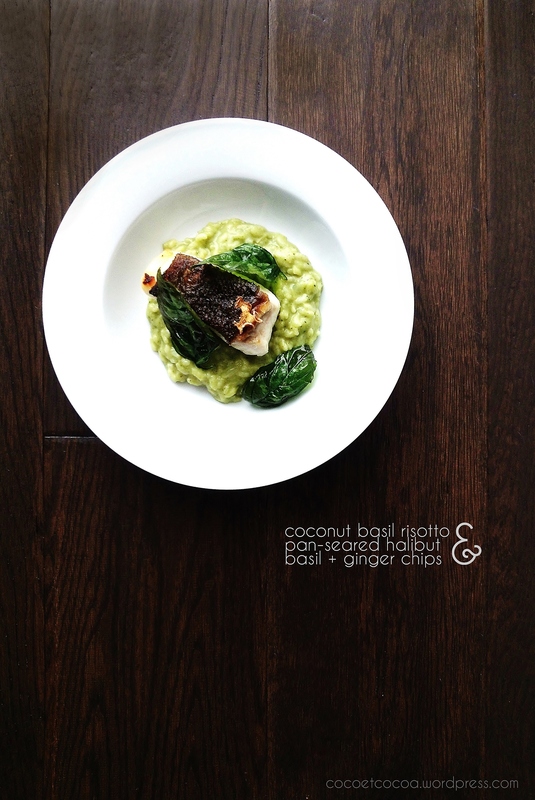 Spoon onto warmed plates and top with the seared halibut, fried basil and ginger (follows). To make the fried garnishes, heat the oil in a small saucepan until a chopstick’s point submerged bubbles vigourously. Add half the ginger slices and fry, spooning the oil over the slices occasionally until golden and crisp. Take them out and drain on a plate lined with paper towel. Repeat with the rest of the ginger. To fry the basil, lower a couple basil leaves to the hot oil – be careful, it will sputter. Fry for 5-10 seconds, until crispy and bright green. Drain on paper towel. For the halibut, blot the portions dry with paper towel and season the skin side generously with sea salt. Heat a heavy-bottomed pan on medium-high heat. Add a couple spoonfuls of the basil frying oil to the pan and swirl to coat in a shimmery layer.Place the halibut portions (don’t crowd the pan, do it in two batches if you need to), skin-side-down in the pan and leave them there for 3 minutes, to really crisp up the skin. Flip them over and cook for another 1-2 minutes, you want to see a thin line that is still translucent beige along the sides. Transfer them onto the plate, keeping the skin side facing upwards, and allow to rest for a couple of minutes before plating. Plate up and serve with a salad as WP suggests or, if it’s a chilly day where you find yourself, consider steaming some green beans and yellow zucchini to brighten up your day!